People flooded out of their homes in Malawi are in urgent need of food, shelter, clean water, blankets, clothing, and basic household utensils, says Caritas. Caritas is appealing for €250,000 (US$280,000) to help the people reeling from floods. 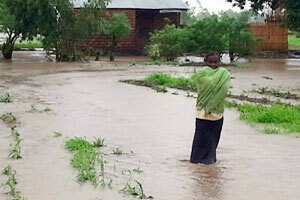 The disaster hit in mid-January and has affected half of Malawi’s 28 districts. Almost 640,000 people have been affected by the floods and over 120,000 have been forced from their homes. The heavy rainfall combined with siltation of rivers and exacerbated by deforestation worsened the impact on communities. Households will be given cooking utensils, hygiene items, water storage and purification items and help to protect them from future heavy rains. Caritas will also work to combat further consequences from the flooding by ensuring people remain camped on higher ground until the rainy season ends in April. It will also work to limit outbreaks of waterborne diseases by not only providing chlorine tablets but also raising awareness early if there are any signs of such diseases. Apart from the damage to crops and houses, 350 schools are reported as destroyed in the floods. Around half of remaining schools in affected areas are being used as camps, resulting in suspension of classes and damaging children’s education. For more information, please contact Michelle Hough on +39 06 69879721/+39 334 2344136 or hough@caritas.va.